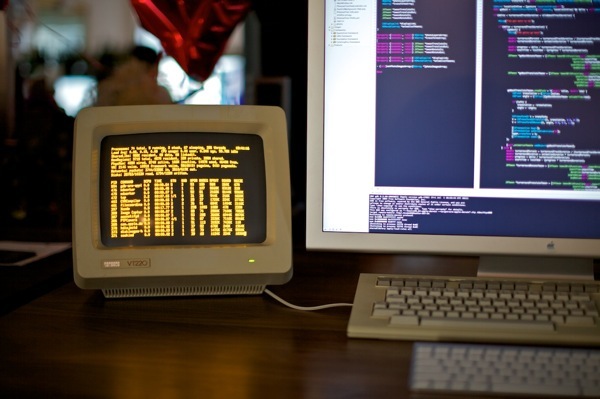 VT220 serial console (circa 1983) set up as a terminal for Mac Pro (2010) « Adafruit Industries – Makers, hackers, artists, designers and engineers! My biggest source of information getting this going was Paul Weinstein’s post about setting up an Apple IIc as a terminal for his Mac mini (which is similar, but not quite the same since the IIc still has to emulate the terminal in software). I got the same USB-to-serial adapter, a Keyspan USA-19HS ($27), which has Mac drivers that I can happily confirm work well with 10.7 Lion. I also needed a null modem cable ($7) and 25-pin female/female converter ($4) to connect it to my VT220. At first I used the same method as Paul to get it working, gluing together the terminal and OS with a utility called screen. As Paul notes, this is less than desirable. It still requires you to open a software terminal to make the connection, and you’re still operating through a layer of emulation. On most Unixes you can simply add a line to /etc/ttys and everything just works via getty, but apparently this has been disabled in OS X since 10.5. Eventually I found this page, which explains the problem and how to fix it. After adding a line in /etc/gettytab to manually set the terminal type to vt220-8bit everything works perfectly! A real hardware terminal directly connected the old fashioned way, with no emulation. Awesome. I love mixing old hardware and new, nothing like getting it done with the hardwire. I don’t know why, but I absolutely love this sort of stuff. I’ve been wanting to get an old serial console hooked into my Mac for a while, but never knew how difficult it would be (or even if it were possible), so I never bothered getting my hands on one. Thanks for sharing! Love me some amber phosphor! Just because of this I tried to get one on ebay. There was only one seller -in the USA- i’m in Germany.